I think they’re properly called baobab trees. That’s the shape of word I seem to recall from Exupery’s The Little Prince, but out here they’ve been cut back. Here they are boabs. They don’t look at home here in the Kimberley. Like all us pink people, like all the Indians here and the Philippinos, like the Chinese, the Koepangers, the Japanese, like all their hybrid descendants, the boabs are newcomers. Baobab trees came here from their homes in Africa, and like so many immigrants they changed their name upon arrival. How did they come? We don’t know and the bird that carried the seed across the seas isn’t telling. They have an odd look, these strange fat-arsed trees, with bark elephant-fawn, leviathan thick, they are exotics. But the land, the generous land took them in. 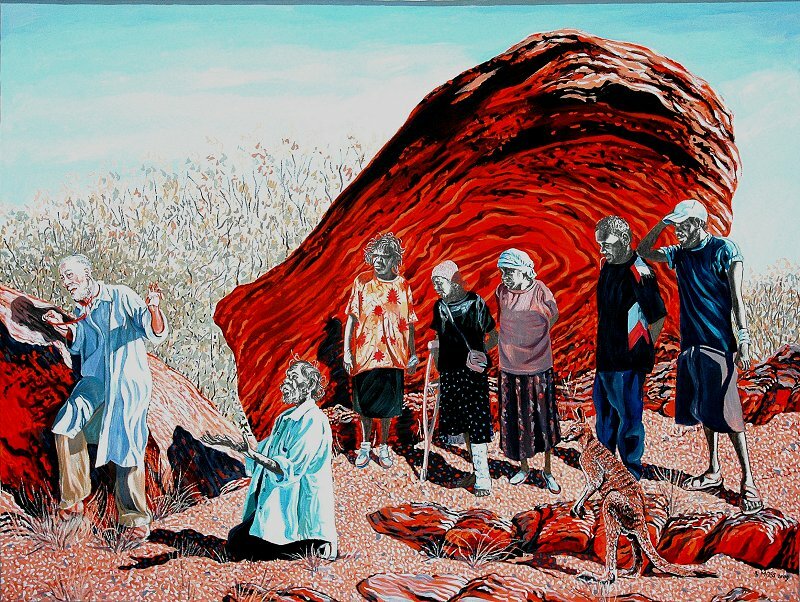 Traditional owners hold the boab ancient, original. Venerated in creation myth, the boab has insinuated itself into culture. Treacherously the Prison Tree outside Derby that impounded slaves blackbirded for the pearl diving is a boab. But for all that Aboriginal people love the boab. I met a boab lover today in the main street of Broome. Hello he said, his face round and fleshy his spherical head crowned with abundant waves of hair. A large smile emerged from the face of flesh. A soft hand extended itself towards me. I took it my smaller hand, which sank within its cushions. Soft and dry, Wayne’s hand held mine. Wayne did not shake. My hand briefly enveloped, at home in the palm of the countryman. Howard, I’ll sell you this. Forty dollars. Wayne held a boab gourd, intricately worked with boab, boab ferns, kangaroo (joey not seen but marsupium visibly bulging), emu and emu chick. A spheroid worked in pointillism by Wayne’s fine kitchen knife. I don’t have forty, Wayne. Will fifty be alright. Wayne and I posed for my self-photography. The boab and Wayne posed for my photography. Howard with camera is no match for the artist that is Wayne with kitchen knife.